Donato Scacciavillani first appears in the Painesville, Ohio, area in 1903. In America, Donato was known as Tony Square. Donato Scacciavillani, son of Felice Scacciavillano and Maria Giovanna Vitolone, was born on November 10, 1881, at Frosolone, Italy. He married Lucia DiIanni, daughter of Gennaro DiIanni and Filomena Incoronata Venditto, on August 5, 1909 at Frosolone, Italy. 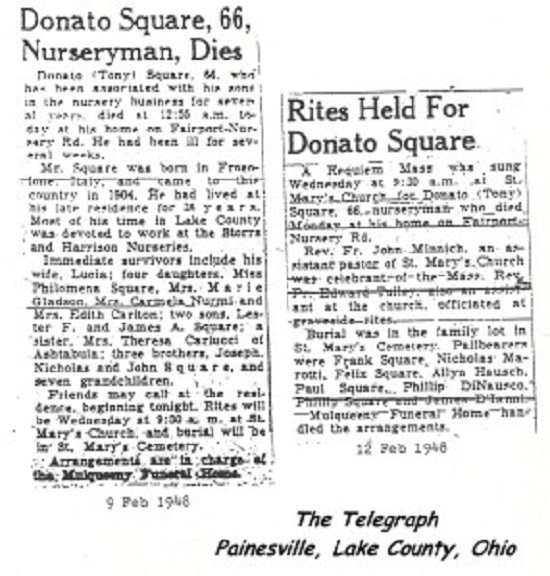 Donato died on February 9, 1948 at his home, on Fairport-Nursery Road, at Painesville Township, Lake County, Ohio, at age 66 of prostate cancer. His body was interred at Saint Mary Catholic Cemetery at Painesville Township, Lake County, Ohio. Donato Scacciavillani first immigrated to the United States on November 10, 1903, at age 22, travelling to Painesville, Lake County, Ohio, joining his brother Giuseppe Scacciavillani. He returned to Italy in 1908 (or early 1909) to marry. 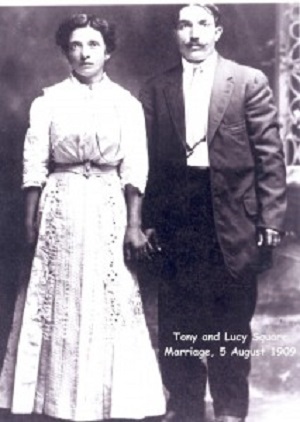 Donato, with his wife, Lucia DiIanni, returned to America on September 20, 1909. 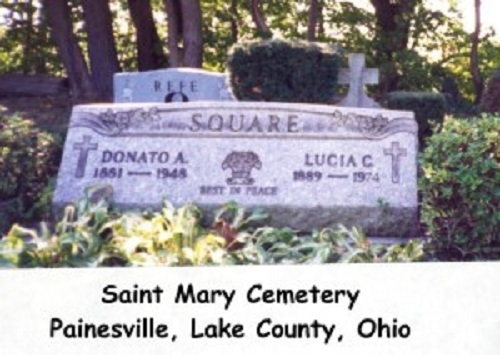 Donato was one of six Scacciavillani siblings to live in Painesville, Ohio. His brother, Giuseppe, immigrated to Painesville in 1898; his brother, Domenico, in 1900; his brother, Giovanni, in 1900; his brother, Nicola in 1906; and his sister, Teresa, in 1910. Additionally, his brother-in-law, Cristofaro DiCristofaro (sister, Donata’s husband) immigrated to Painesville in 1897. Donato was a long term employee of the Storr’s and Harrison’s Nursery. 6. Edith Marjorie Square was born on August 16, 1925. She married first, Harry Smith Carlton, son of Harry Smith Carlton and Elizabeth Pritchard, on Saturday August 18, 1945. After Harry passed away, Edie married second, Edsel Pfabe, son of Howard Pfabe and Lula Hemphill, on Monday January 18, 1993 at St. Lucy, St. Lucie County, Florida. Edie is the last surviving Square cousin (of the 41 grandchildren of Felice Scacciavillani and Maria Giovanna Vitolone) of her generation.